Bashabe Merriels standing by a fence from her ankles up. 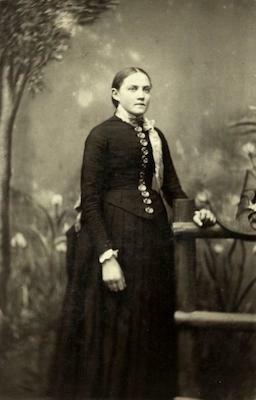 She has on a dark long sleeve dress with white around the sleeves and neck and large buttons running vertically on the top of her dress, and a ribbon is hanging down from the neck. The photo is on a pink card and has "Bashabe Merriels" written on the back.